These fried sweet potato chips are a nice change of pace from regular potato chips, and though they are higher in natural sugar, they are lower in carbohydrates. 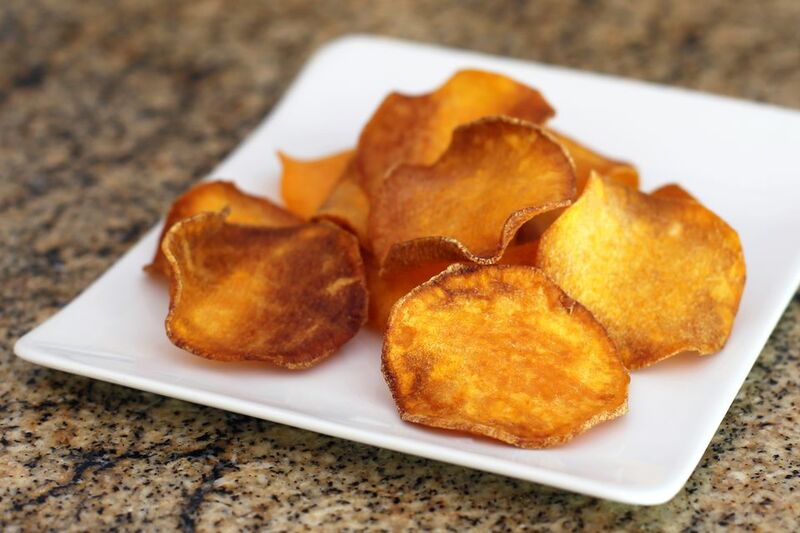 Feel free to spice these fried sweet potato chips up with some spicy Cajun or Creole seasoning or another spice blend. Peel the sweet potatoes; cut them in half lengthwise and then slice very thinly with a mandoline or the slicer attachment of a food processor. Place the slices in a medium bowl and cover with cold water; let them stand for about 1 hour. Remove a handful of sweet potato slices from the water and drain well on paper towels. Heat the oil to about 355 F to 365 F in ​a deep fryer or about 1 inch deep in an electric skillet or deep skillet on the stovetop. Make sure the pan is no more than half full of oil. Place a double layer of paper towels across a large bowl or container. Fry the sweet potato slices in one layer batches for a minute or two, or until golden brown. Lift chips out with a slotted metal spoon and let excess oil drip back into the pan. Transfer the slices to the paper towel-lined bowl and gently shake the bowl or grasp the paper towels by the ends and move back and forth so the chips will drain thoroughly. Remove them to a pan lined with paper towels. Repeat with the remaining chips. Let the chips cool completely and then sprinkle with salt before serving.